Rauisuchians were a group of carnivorous (meat-eating) archosaurs that lived during the Triassic period. 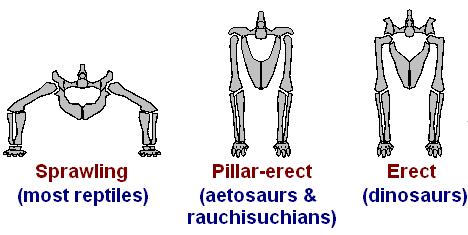 Rauisuchians were all quadrupedal (walked on four legs), and like Aetosaurs had a pillar-erect limb posture. The erect gait of Rauisuchians is evidence that they were active and agile predators - and their gait was clearly an advantage of many of those of their prey animals which had less advanced locomotion, such as Dicynodonts and Rhynchosaurs.